Time to pick up the keys to our new little house in the Algarve. It feels like I’ve been counting down the days obsessively since we had our offer on it accepted on 23rd December, and that’s because I have. No, far more obsessively than that: tally charts, crossing off multiple calendars, writing the new total days in my diary every day and Tippexing the previous day’s count out, counting over and over again just in case I got it wrong and it wasn’t REALLY that long to wait. And now it’s here and it feels weird, extremely stressful, and weird. Keith will be here for most of the next 6 months, I will be to-ing and fro-ing to the UK to work in order to keep us in fava beans and piri piri chicken. We’ll see how that goes. 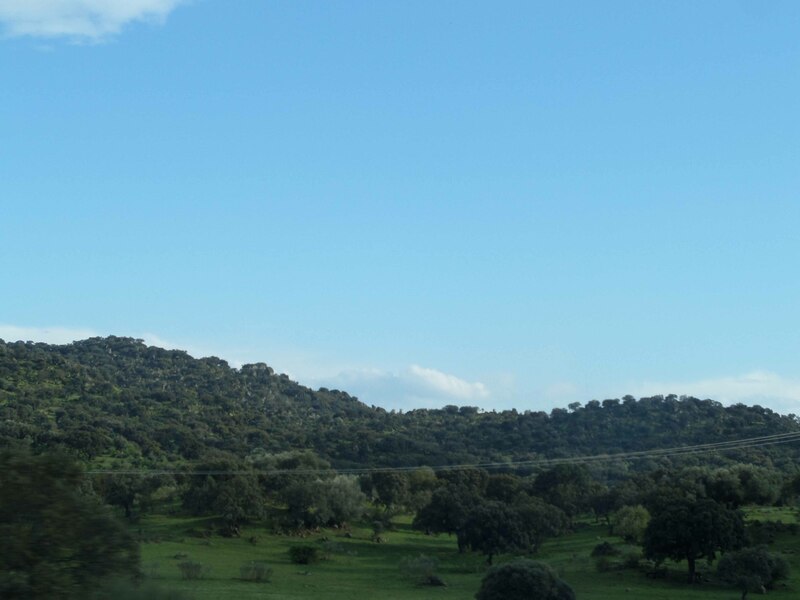 We decided to drive to Portugal so that we could take plentiful supplies of muesli, Listerine and Johnson’s talc – all things which are widely available in Portugal, but things which Keith can’t live without (see: Bold Crystal Lily Rain thing), so no risk could be taken. 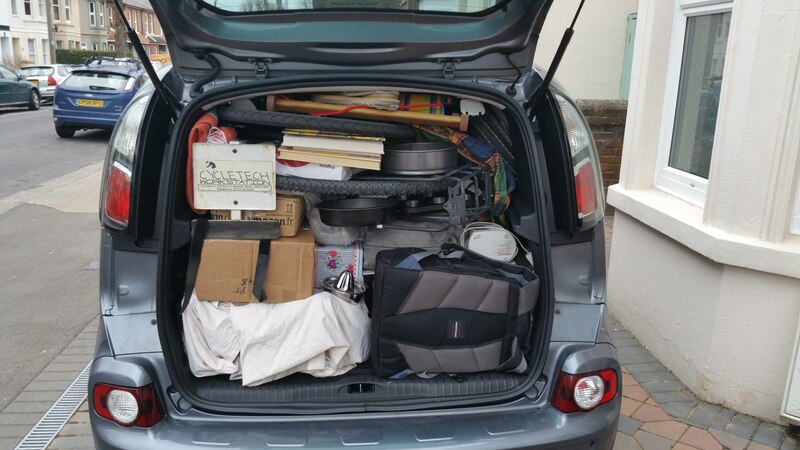 Had we considered that the car would do somewhere in the region of half its normal fuel consumption due to the ridiculous amount of stuff we packed into it and on to it, perhaps we would have thought again. 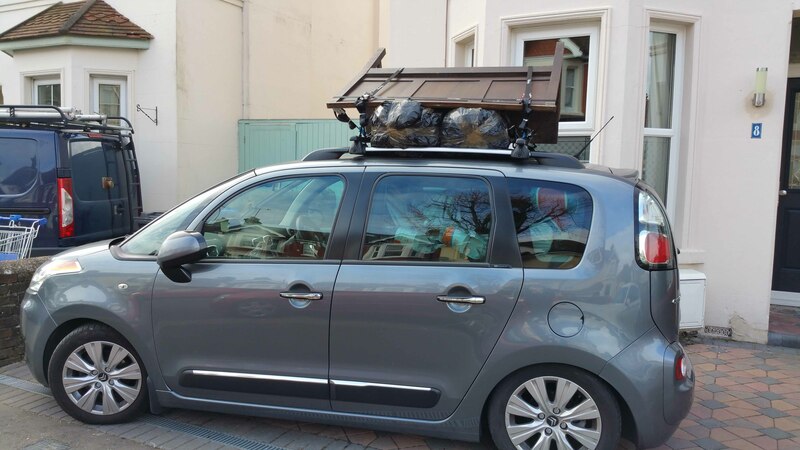 Added to that we also had to buy a roofrack to put the bench that someone (me) took a fancy to in a second hand shop and wrongly calculated that it would fit in the boot. Expensive bowl of porridge, that. The sensible bonus of taking our car is that we don’t have to pay for car hire over the expensive summer months – you can legally take a car to Europe from UK for 183 days each year (as long as your insurance and MOT is sorted). We caught the Plymouth-Santander ferry which is a 19 hour voyage of joy last travelled in reverse on our way back from last summer’s Channel to Spain bike ride. The onboard musak features low budget cover versions of familiar songs sung in such a way that they sound absolutely nothing like the original. It’s as though the vocalist was given the lyrics of a song completely unknown to them and asked to make up their own tune. The result is an interesting game of Name that Tune and a wonderment that anyone can destroy a perfectly good Hall and Oates song quite so magnificently. On the subject of music, you’ll be pleased to know that Sinitta is alive and well on Spanish radio. Once in Santander its a 600 mile drive down to the Algarve. 600 claustrophobic miles sat in an overloaded car with a picnic box and a rucksack on my lap because the boot was full of Alpen and Marmite. 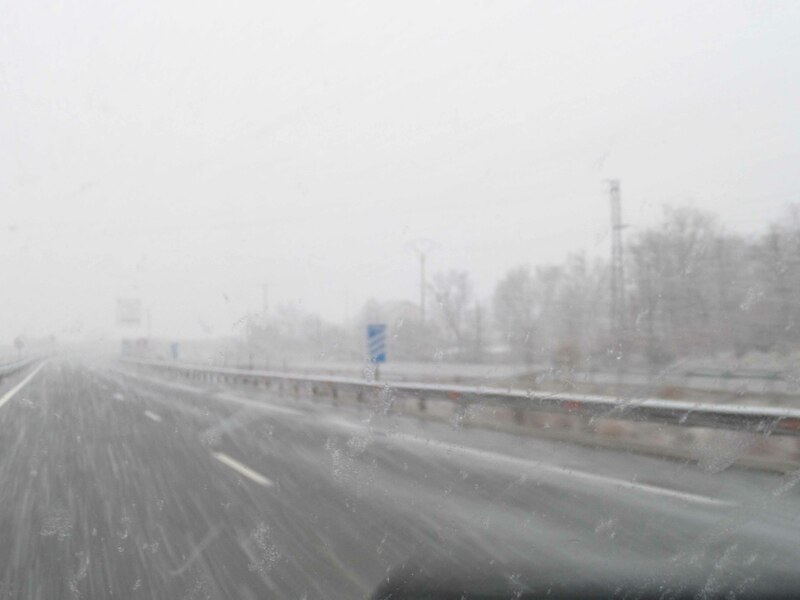 The weather was interesting to say that least with a snowstorm and temperature of 0 degrees. In Spain. Bloody grateful not to be on a bike this time. I may have said before how much I really like kilometres. There are more of them, it’s true, but they pass so much more quickly than miles and are far more satisfying in terms of progress. We did more than a thousand of the buggers. We spent the night in a hotel in Merida and went for a wander in the evening. I had never heard of the place but it has an incredible amount of Roman architecture all over the city. We had some food in a tapas bar and ordered various random unknown things from the Spanish menu which turned out to be clams and cuttlefish. Er, yum? I am one of those people who feels the need to at least make a dent in the food that is given to me, even if I really don’t like it. It’s a stupid trait considering I’ve paid for it, but that’s the way it is. Keith doesn’t feel any social requirement to not upset the chef, so my burden is not even shared. Let’s just say that I have committed the Spanish word for cuttlefish to memory so that I never make that mistake again. Not a patch on KFC. 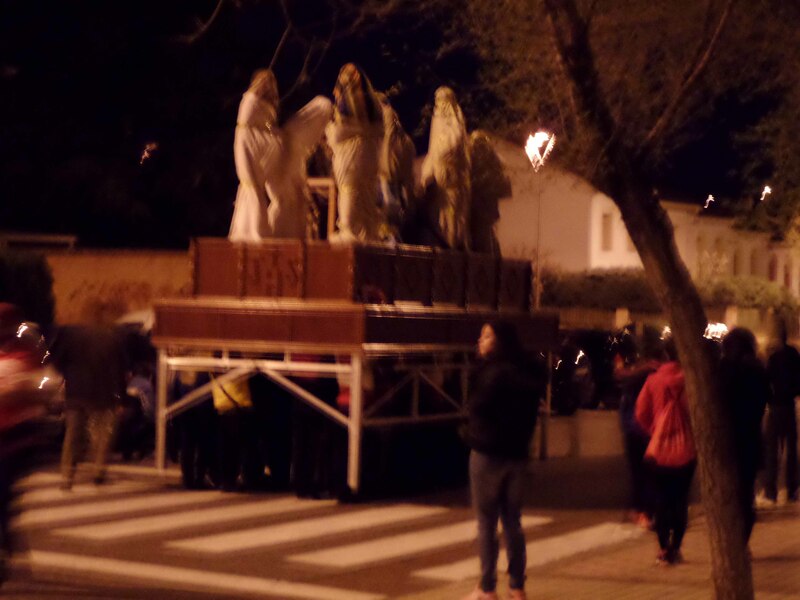 On our way home we passed what can only be described as 40 people carrying a giant bed with some wrapped up statues on top accompanied by a brass marching band. The quality of the photo is poor, but there are definitely 40 people walking extremely slowing under there. Makes my picnic box on the lap car experience comfortable by comparison. Don’t their heads hurt? Are the ones in the middle freaking out? Where are they going? So many questions and no answers. Much like life, eh? Our past experience of stumbling across random festivals (the tuna stew competition in Castro Urdiales springs to mind, the ‘Let’s-dress-up-as-pirates-and almost-drown-swimming-across-the -bay’ in San Sebastian does too) says that this is standard fare for Spain, even at 9.30pm on a Monday evening in March. I presume this was some kind of practice for an Easter do of some religious nature but it might just be what the Meridians(from Merida?) do for fun. Next morning provided another opportunity for ‘Asians at Breakfast’ (last seen in Athens), which involves watching the coachload of middle aged Asian tourists navigate a European breakfast buffet. Today’s piece de resistance combo was bacon, egg and doughnut. There are Japanese people sitting in hotels in Tokyo at this moment crying with laughter at Europeans eating the Japanese food faux pas and mixing their bento with their sashmimi. Back on the road and eventually arriving at Casa Torta, our house; which translates as ‘crooked’ or ‘cake’, so take your pick. 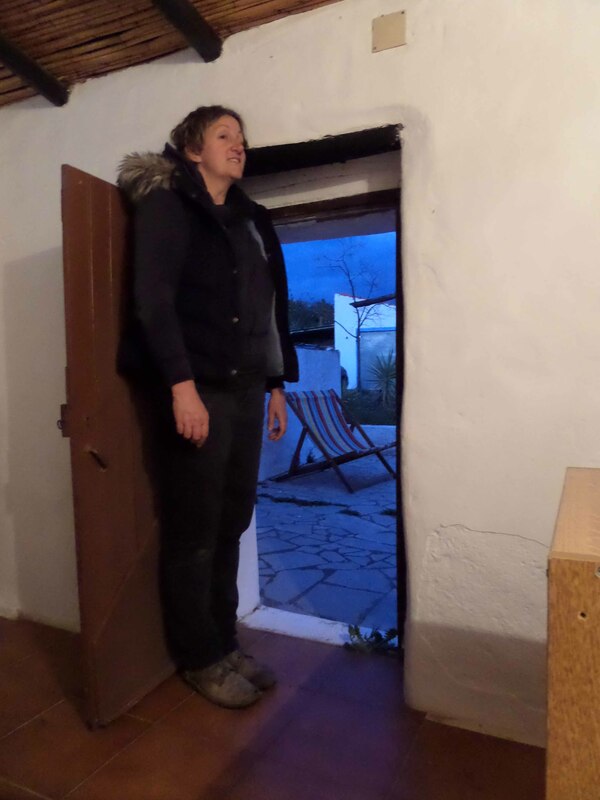 Both fit pretty well given the predilections of the new residents and the height of the doorways. OK, so it was all we could afford. What’s a daily dose of mild concussion in exchange for a life in the sun. This is the view from our house once you have ducked down far enough to leave it. It is the same view as from the much larger, luxurious and expensive villas which surround it. Our house is the slightly drunk, dishevelled uncle at a family gathering: seen better days, wonky and with an odd smell. But you love him all the more for it. The house has been empty for many months – or so we thought. On opening up Keith’s old French house, we were frequently greeted by scorpions. Here, it’s lizards, big ones with suckers on their feet. Our new squatters. They are far, far more welcome than a scorpion, although that opinion is subject to change the night that one falls on my face from the ceiling. When we went to Santorini, we found that the lizards there were partial to cake, so maybe these are too. First meal at our house. 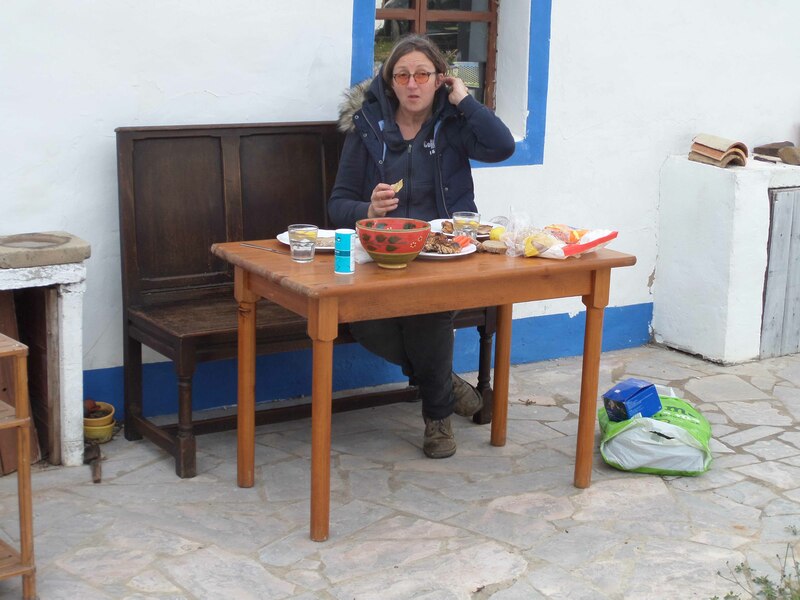 Too cold to eat outside really, hence the coat, but it’s not every day you move to Portugal. 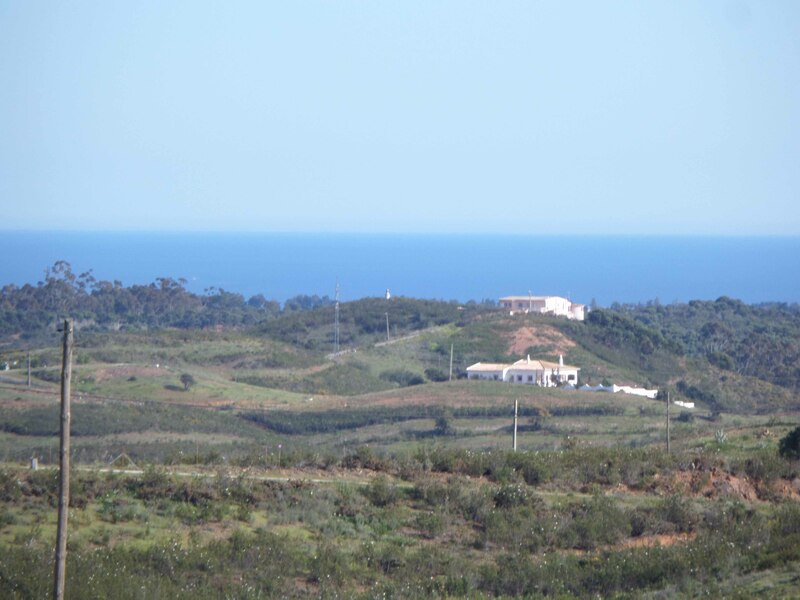 This entry was posted in Living in Rural Portugal and tagged Algarve, Brittany Ferries, merida, Portugal, Tavira. Bookmark the permalink. Yours lizards look like Geckos. Do they make a chirping noise? Not heard one. They were pretty silent (shocked). 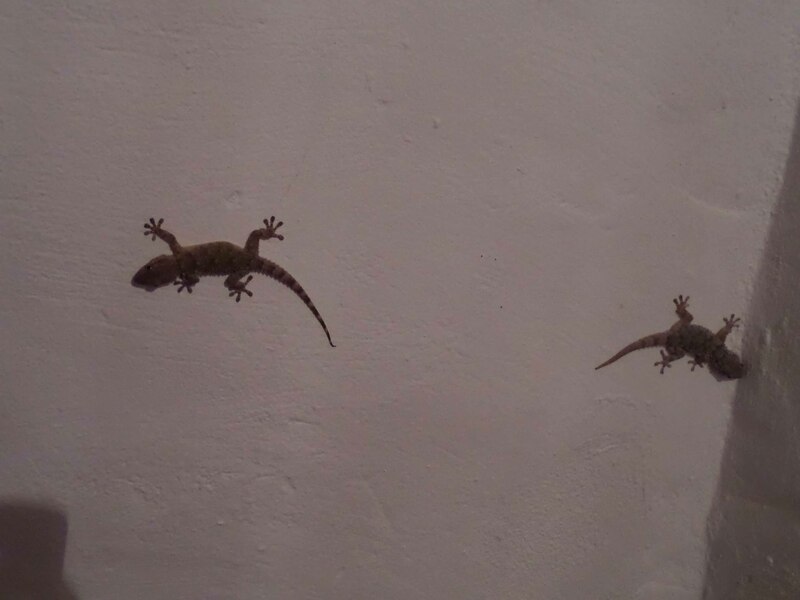 Don’t let the lizards deter you, Hope you’ll have a fabulous time in Portugal! Thank you. The lizards (geckos, I’m told) are wonderful! Your blog looks great, I shall read more.